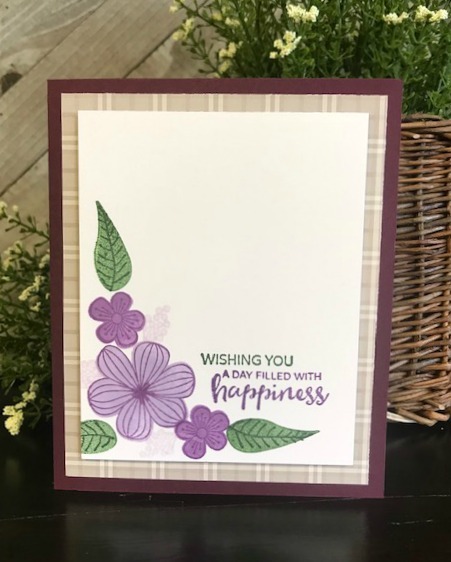 Happiness wishes are the goal of this floral card, just in time for the spring season. This card is also made from a layering set of stamps. Start with a white piece of cardstock and begin stamping with the lightest shade of purple the small flowers. Next in a darker shade of purple stamp the base petals of the big flowers. Then stamp the outline and detail of the big flowers with the darkest shade of purple ink. The leaves are two shades of green ink the lighter the base of the leaves and the darker is the outline. The sentiment was then stamped in two different colors the top line in dark green and the bottom portion in dark purple. This card is sure to be received as happy mail indeed.